Even though computers are more powerful and capable of doing more than ever, you have to remember that they are still delicate pieces of electronic equipment. If you keep any kind of business data on your computer, is your data safe? Should a business computer ever be lost or stolen, or if your physical store were to suffer from a natural disaster, would you still have complete access to your data? KineticD is here to protect your business data as well as your peace of mind not only by offering exemplary cloud backup software, but also by educating you on the advantages of backing up your business data onto a cloud. It was recently reported that 98 percent of SMEs in the United States utilize cloud backup services. Despite this fact, it was also revealed that backing data up onto a cloud isn’t as commonplace in America as it is in other parts of the world. Just as you should still get insurance if you drive one of the most advanced, secure and highly rated automobiles, the same applies for businesses that use the most advanced and powerful computers to store their business data. Hard drives and external memories can do a lot, but they are still quite fallible. Even if you have your business data backed up onto a hard drive, it’s still a good idea to have a backup to your backup on a cloud. Even if you never lose any of your business data, backing it up on a cloud ensures that you have access to that data no matter where you are or which device you’re using. Now traveling employees can feel as though they’re still back in the office while they’re on business trips. Something else to think about is that your business data can become corrupted, infected with a computer virus or simply vanish with no discernible reason other than the fact that you turned your computer on. You may be surprised to learn that between 92 and 100 percent of respondents in a recent international survey stated that they had to recover files at least once a week. Imagine what would happen to your business if you were unable to fully recover all of your information. How many orders would go unfilled? How much money would you lose? 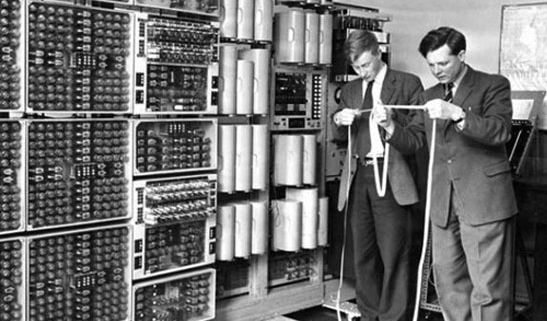 How much time would you waste attempting to get your data back? Once you’ve decided to take your business into the clouds, you’ve got to find the perfect company to take you there. Here at KineticD we will treat your business and your business data as if it were our own. Poorly implemented backup strategies and software don’t do us any good, which means they won’t do you much good. You get to decide whether your data is backed up daily, weekly or monthly. Another great thing about using a cloud to backup your business data is that you don’t have to install any type of software or plug anything in. All you have to do is log into your account and all of your files are there at your disposal. To keep your business from freefalling due to lost data, turn to the experts at KineticD. Here at KineticD we are always striving to make sure that our customers have the most comprehensive cloud backup experience possible. Business owners and their employees probably use their smartphones as a second computer, which means that eventually they’ll have to access business information when they’re on the go and away from their office computer. With our new iOS backup app you can bring your business data with you right in your pocket. Currently, the KineticMobile app is designed to be used with the iPhone, iPad and iPod Touch. In order to use the app, you’ll have to have an existing cloud backup account with us or sign up for a new one. 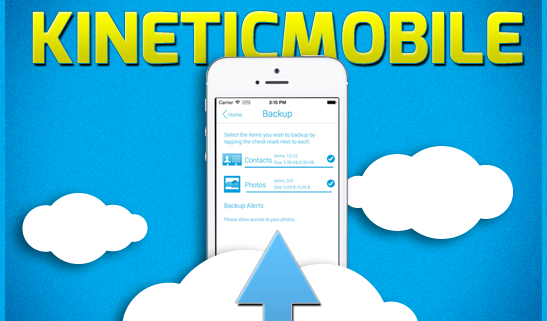 The app is free to download, but you’ll need a KineticD account in order to backup anything on your phone or tablet. Once you’ve downloaded the app, you’ll be able to seamlessly access and share your business files no matter where you are. Even though computers are getting smaller and smaller, you probably don’t want to carry yours around with you everywhere that you go, which is the glory of having a smartphone that thinks it’s a computer. Imagine saving a picture to your computer that you’d like to send to a friend. You forget and head out the door only to run into that friend while you’re out. Instead of making yourself a note to send them the picture, all you have to do is access the KineticMobile app and pull up the picture right on your phone. Another instance in which you can use our app is when you’re having lunch with a client and you’d like to share a presentation, product or service with them. Rather than pulling out your laptop and taking up space on the table, you can instead access the cloud data on your phone and give the client a taste of what you have to offer. Now they’re hungry for more than just lunch. Imagine never having to worry if you forget your computer or if your hard drive crashes. While the dust is settling, you’ll still be able to carry on with business as usual. The KineticMobile Apple backup app and our regular cloud backup services will make sure that your potential business energy is turned into kinetic business energy. Another great thing about our new application is that it gives you the ability to see your current computer screen and even use your iPhone, iPad or iPod Touch to operate your computer from anywhere using built in remote desktop technology!. One of the biggest obstacles of small and medium businesses is that they simply don’t have the financial resources they need for a comprehensive and quality backup process. KineticD wants every business owner to have the tools and resources they need to be properly prepared for any disaster at any time. We also want to give you the power to take your business to the next level without taking your business expense accounts to a lower level. KineticD is here to boost your business even higher than the clouds with our all-new KineticMobile app. Now your smartphone can become your next greatest business tool.